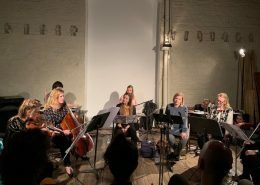 Berlin’s MaerzMusik Festival calls itself a “Festival for Time Issues,” and in an essay about this year’s fifth edition artistic director Berno Odo Polzer writes that current installment “dedicates its ten days to questions pertaining to history and historiography. History understood as an alive, animate, spirited realm that reaches deep into the now.” Indeed, many of the performances I experienced examined or drew upon the past as crucial source material, drawing attention to events, movements, and thinking that still weighs heavily on the present, especially in an era where there’s so much reckoning, denial, and revisionism of the past in how it relates to where we’re all headed. The past is continually reopened—necessarily; ripped off like a scab covering an unhealed wound. Additionally, the programming of the festival juggled aesthetics of the past, present, and future – often uncomfortably so – in connecting concerts that represented an institutional strain of contemporary music (presented in storied concert halls) with something much more underground and questioning (heard in repurposed industrial spaces). The premiere of the then + the now=now time, by British vocalist and movement artist Elaine Mitchener (pictured above), laid bare many of these ideas. Her performance at Silent Green – an old crematorium converted into a cultural center – hit hard. Citing Walter Benjamin’s concept of Eingedenken, a coinage that conveys a memory blending remembrance and mindfulness – not to erase or memorialize the past, but to reshape it as a living thing – the singer and her choreographer, Dam Van Huynh, created a single-performer work that loosely wove together movement streaked with violence and visceral struggle, quotations from Benjamin, bell hooks, Sojourner Truth, James Baldwin, and Abel Meeropol related to Benjamin’s concept, the lyrics of Billie Holiday’s forever-bracing “Strange Fruit,” and elliptical imagery by the Mitchener herself. Mitchener, who’s an adept within multiple musical traditions, including improvisation, functioned as a multivalent vessel, stringing together images and memories of what the descendants of African slaves have been forced to endure in the U.K. and the U.S., among other locales. She stretched, repeated, and reordered words with the dexterity and resourcefulness of a seasoned improviser, extracting shifting meanings and changing emphasis. Her presence was intense. She arrived on the stage and seemed to survey the audience, peering out with a mixture of fearlessness and suspicion, before wending her way through the thorny text. Her singing was packed with extended techniques – clicking, snorts, growls – that punctuated phrases like, “The true picture of the past whizzes by / Only as a picture…is the past to be held fast.” For much of the piece she was accompanied by a collage-like backing track that included a British MP reflecting on the inhumanity visited upon the descendants of slaves despite their having served in the British armed services in both world wars, throbbing low-end bass tones, crowd noises, some kind of Caribbean folk song—imbuing diverse meaning to the torn-apart words she sung. Mitchener’s piece deliberately asked questions without clear answers—as if there ever could be one. She provided an act of interrogation rife with pain and confusion, leaving a trail of memory that required heavy sorting and contemplation on the viewer’s part. Austrian composer Olga Neuwirth was featured prominently on a pair of events in more conventional settings. An orchestral concert at Konzerthaus Berlin placed her Masaot/Clocks Without Hands as the closing work on a program also featuring work by Ashley Fure and Juste Janulyte. The piece originally was commissioned by the Vienna Philharmonic in 2010 for the 100th anniversary of Mahler’s death, but due to Neuwirth’s busy schedule it was pushed back four years. But she kept a connection to Mahler in the work, embracing the eclecticism of his brash First Symphony. Neuwirth was inspired by a dream she had in which she was visited by her grandfather—a man she knew only through old photographs. He appeared to her on the banks of the Danube, holding a beat-up tape recorder that played a stream of songs. 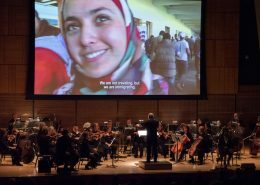 He told her, “This is my story.” The work was given a lively performance by Konzerthausorchester Berlin conducted by Peter Rundel, its cacophonous collision of brass band music, Balkan folk dances, Viennese waltzes, and more teetering between fantastical and nightmarish. The work stood in stark contrast to the dramatically constrained pieces on the program’s first half. Fure’s 2016 piece Bound to the Bow is marked by scratching, sputtering, and rubbing sounds, with an electronic presence derived from experiments that involved recording sounds of an electric fan fitted with pieces of rubber thwacking various objects. All of that frenetic activity was inspired by the vision of the albatross in Coleridge’s Rime of the Ancient Mariner, attached to the bow of a ship, and the sounds evoke the bird’s futile struggle to take flight. Was There a Swan? by Lithuanian composer Janulyte received its world premiere, and beautifully illustrated what its creator calls “monochrome music” – only strings, only winds, or only voices. But here she employed the full orchestra, with a prominent role for organ played by Martin Knizia. Lines in the organ’s highest register opened the piece, unleashing a mesmerizing collision of translucent, richly textured sound. A levitating din both sumptuous and fraught came to a close in the same fashion in which it started; it felt like a symmetrical dreamscape. 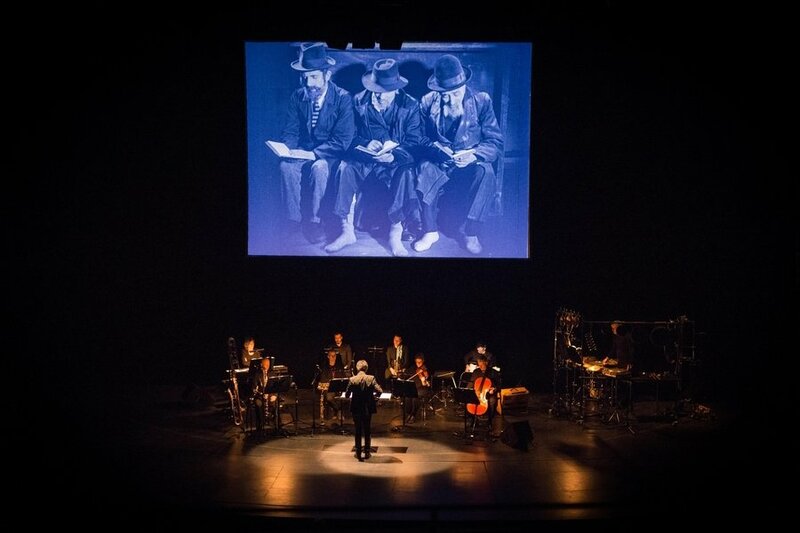 Neuwirth’s original score for Stadt ohne Juden (“The City Without Jews”), a recently discovered 1924 Austrian silent film based on a novel by Jewish writer and journalist Hugo Bettauer, was performed by the Viennese chamber ensemble PHACE at Haus der Berliner Festspiele, but failed to live up the film’s back-story and prophetic plot. Fourteen years before Kristallnacht, the novel envisioned a fictional city called Utopia where Jews – portrayed in often unsettling caricatures by director Hans Karl Breslauer, who later joined the Nazi party – are expelled from the city by a sleazy demagogue. Unlike what happened in the near future, the citizens soon realize how important the Jews are to Utopia’s financial well being, and they eventually welcome them back, with a trite, happy ending. The intertitles in the film were all in German, a language I don’t speak, so I could focus only on the ugly stereotypes, but this clearly was not a cinematic achievement. Still, there were some striking images of Jewish life, including a dazzling scene of a synagogue service. Neuwirth’s music was a pastiche of early 20th century references, a post-modern mash-up that only related to the visual elements in rather heavy-handed ways, but most of the time the score and the film felt disconnected. The closing event of the festival was a 30-hour extravaganza called “The Long Now,” presented in a dazzling repurposed factory now called Kraftwerk. The venue was outfitted with some 300 cots and 30 gym mats, and many of the patrons took in the experience on their backs. The program, setting, and atmosphere (not a shred of natural light could be found) were designed to allow the attendee to lose sense of time, and thus the music cleaved primarily to ambient electronic music with some excursions into just intonation and drone. I didn’t take up a cot, and witnessed performances either in a chair or standing up. The event opened brilliantly with an hour-long set of vocal chants by soprano Anne-Kathryn Olsen—she was placed in the middle of the sprawling audience, bathed in a single white light, and her voice filled the massive space with delicate beauty amid the crowd’s gentle conversational murmur. As her performance was winding down, another female voice subtly sang sporadic tones, overlapping in such a way that it was almost undetectable—but it was impossible to know where it was coming from. Eventually I spotted Norwegian singer Stine Janvin slowly approaching the main stage, dissecting the crowd. As she got closer to the stage and Olsen had finished, Janvin’s tones grew shorter, more frequent and louder. Her unamplified, high-pitched tones had no problem projecting throughout Kraftwerk. 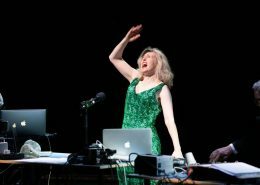 She performed music from her dazzling 2018 album, Fake Synthetic Music, constructing short, wordless melodic shapes heavily transformed by electronics. Given the demanding range of the material and the hour-long duration of her set, she shied away from the more extreme, physical pieces on the album. But Janvin was still dazzling—especially when immersed in Morten Joh’s dynamic lighting design. She manipulated voice fragments into hypnotic minimalist nuggets that flowed continuously from one piece to the next. 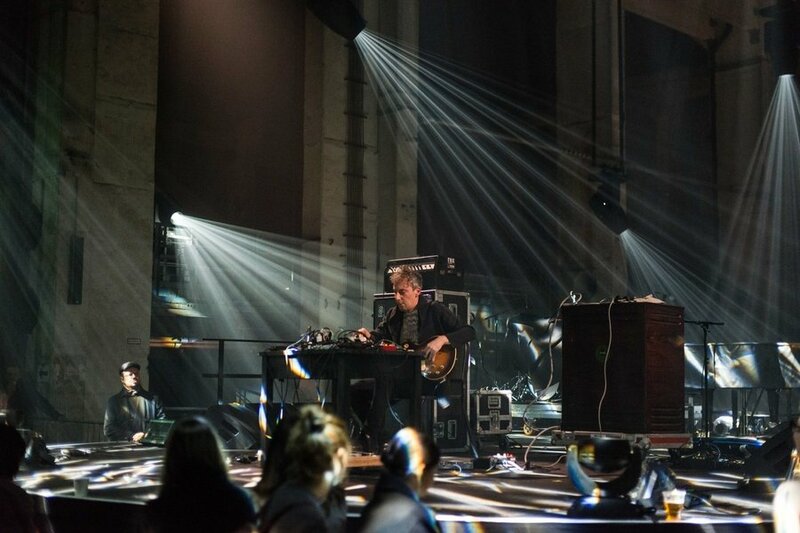 Other highlights included a brief set by Australian guitarist Oren Ambarchi, who fed his probing explorations through a Leslie speaker to produce a shifting, vibrato-stuffed soundscape. In an early morning concert Finnish sound artist Marja Ahti produced a marvelously textured meditation, in which lulling electronic drones were brilliantly pierced by the sounds of chirping birds, droplets of water falling, and pinging resonance produced on a set of Tibetan prayer bowls. A few hours of much-needed sleep at my nearby hotel prevented me from catching most of a seven-hour just-intonation marathon called “The Harmonic Series,” organized by Duane Pitre. But I did hear a two-hour performance by Catherine Lamb, who blended a slow walk through a set of spare harmonic material with sounds from the Secondary Rainbow Synthesizer she devised with Bryan Eubanks, which allowed her resonant keyboard glow to be enhanced by the explosion of early morning birdsong occurring outside the walls of the venue. Later that morning the Berlin-based ensemble Tonaliens, joined by guest cellist Judith Hamann, played a gorgeous 90-minute piece marbled with resonant harmonic effects. Each member of the group – invented wind instrumentalist and saxophonist Werner Durand, tubaist Robin Hayward, and trombonist Hilary Jeffery – was given extended solo space, creating dynamic interplay with the mewling churn behind them. In the early afternoon of the event’s second day, pianist-composer Frederic Rzewski changed the tenor of space with a lovely reading of his classic The People United Will Never Be Defeated, along with the world premiere of Six Movements. His performance illustrated the biggest drawback of the “Long Now” event: it was the wrong venue for close listening. For the onslaught of ambient music the setting was fine for those that just wanted to zone out and lose track of time. The connection between performer and listener was tenuous at best, and while the sound engineers did a remarkable job, nothing short of an act of God could have prevented the pounding low-end sound emanating from Ohm, the celebrated night club located in Kraftwerk’s basement, that pummeled Lamb’s delicate set with a thrumming din. In addition to evening concerts, MaerzMusik included loads of readings, lectures, public talks, and discussions. But the most impressive part of the festival was Tele-Visions, a six-screen installation that offered 10 hours of continuous programming throughout the fest’s entire run. The curators amassed over 250 videos and films drawn from more than 40 archives dealing with new music. 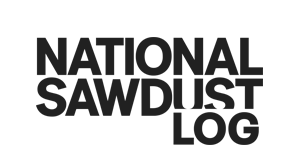 Much of the footage came from German television, with programs devoted to the work of composers like Xenakis, Schaeffer, Ligeti, Nono, and Kagel, among many others, as well as the complete run of Robert Ashley’s essential Music in the Aether With Roots. The curators also represented free jazz figures like Ornette Coleman, Sun Ra, John Coltrane, and Cecil Taylor, as well as1 Derek Bailey’s wonderful four-part BBC-produced program on the practice of improvisation. The installation offered attendees multi-channel headphones so they could move easily between six projections, sitting on comfortable sofas and armchairs and soaking it all in. As much as MaerzMusik presented a feast for the ears and eyes, the sprawl sometimes seemed a bit too unwieldy. I’m an adherent to a full-spectrum program, but the array of individual events allowed listeners to easily avoid things they didn’t know in favor of those they found appealing. Of course, there’s nothing good about forcing people to endure sounds they don’t like, but at the same time more modest programming can make new discoveries for listeners a bit easier. The programming didn’t always make the time concept explicit, but the materials and performances there were ripe for listeners to make their own connections, to divine an ever evolving and changing continuum from a massive pile of work. I’m still putting pieces together. Peter Margasak is a longtime music journalist who spent more than two decades as a staff writer for the Chicago Reader, and also has contributed to Downbeat, Chamber Music, Bandcamp Daily, The New York Times, and more. Since 2013 he has curated the weekly Frequency Series at Constellation in Chicago, and since 2016 has been artistic director of the Frequency Festival. He presently is attending the American Academy in Rome as part of its Visiting Artists & Scholars Program. In Review: Ensemble neoN Playlist (A century lost to memories).